Participants take part in the Kairos Blanket Exercise. National Aboriginal Day, or Solidarity Day, is celebrated each year in Canada on June 21st as part of National Aboriginal History Month. Celebrations and activities are held across the country in Indigenous and non-Indigenous communities to commemorate the culture, history, and contributions of the Indigenous peoples. 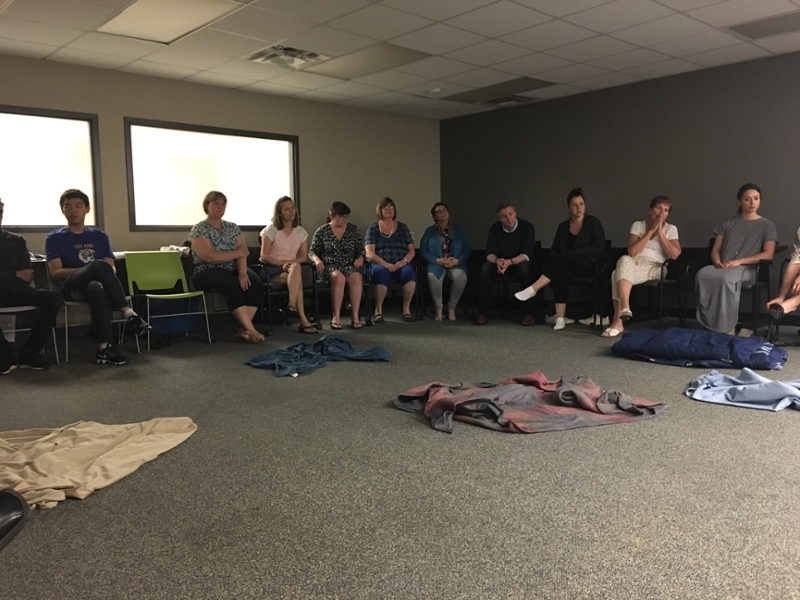 The Centre for School Mental Health and The Fourth R observed the day by taking the opportunity to host the Kairos Blanket Exercise. The Kairos Blanket Exercise is an interactive learning activity used by Mike Cywink, Student Mentor and Program Liaison for The Fourth R’s Uniting Our Nations in area schools and organizations as a teaching tool to demonstrate the historic and contemporary relationship between Indigenous and non-Indigenous peoples in Canada. The exercise asks that participants take on the role of various Indigenous people in Canada. While standing on blankets that represent at first Turtle Island and then North America, participants walk step-by-step through the realities of pre-contact, treaty-making, colonization, and resistance in Canada. The leading facilitators play the role of narrator and European colonizers. Each member is directly involved in the activity through the distribution of reading scrolls and carrying cards which determine the outcomes of not only the participants acting as Indigenous people, but the thousands of others that have and continue to experience these traumas and hardships in reality. Participants become emotionally and intellectually engaged as the story advances. A smudging ceremony prior to the activity and debrief session following the exercise allow each of the respective attendees to confront the many emotions they may feel. The development of the blanket exercise was reactive to the 1996 Report of the Royal Commission on Aboriginal Peoples (read more here). This document recommended education on Canadian-Indigenous history as one of the many key steps to reconciliation. The blanket activity covers over 500 years of history among these groups in a one and a half hour participatory workshop. Cywink and Susan Dale, Program Development & Implementation Coordinator for The Fourth R facilitated the exercise with 30 participants comprised of staff, faculty, and students from the Faculty of Education. Mike and Susan have led this exercise many times under the request of teachers, students, trustees, and additional organizations in the London area. 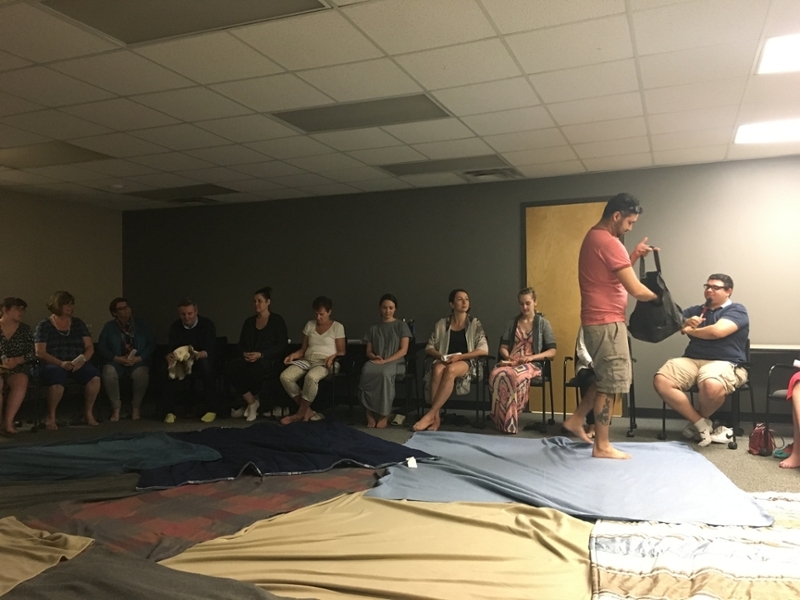 Although the exercise is a chance for participants to learn the true history and current relationships of Indigenous and non-Indigenous peoples, Mike reflects on the exercise as follows, "As a First Nation man, the blanket activity isn't a fun, enjoyable facilitating experience for me. The reason I do it, is because of the importance of the information, message and reality it presents. 90% of the time afterwards, participants are like "wow, I had no idea that happened." To move forward, we must have an understanding of each other, and part of that understanding is knowing the true history of Canada when it relates to First Nations people." 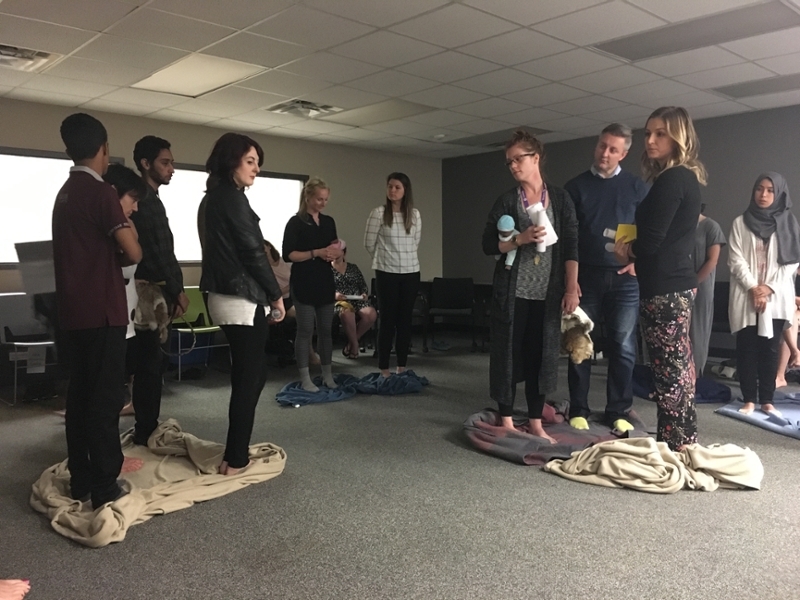 To learn more about the Kairos Blanket Exercise, click here.